When Barack Obama took office four years ago, reducing the budget deficit was a middle-tier item on the public’s agenda. Only about half of Americans (53%) viewed it as a top policy priority in January 2009, placing it ninth on a list of 20 policy goals. 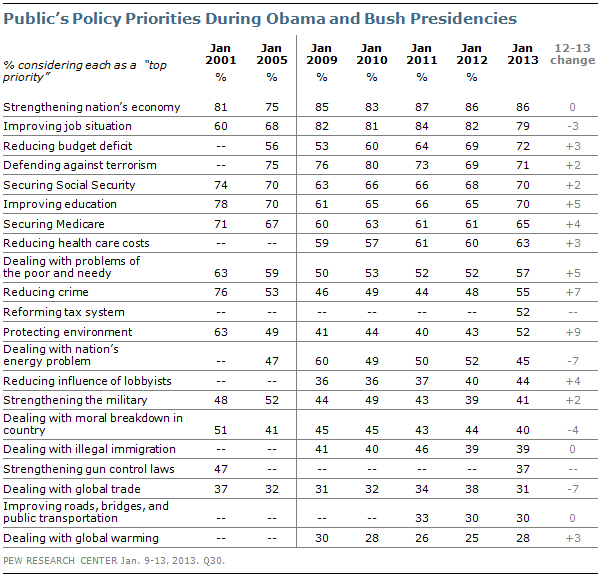 But as Obama begins his second term, only the economy and jobs are viewed as more important priorities for the coming year. Currently, 72% say that reducing the budget deficit should be a top priority, up 19 points from four years ago. (Click here for a graphic of the public’s 2013 priorities). The latest national survey by the Pew Research Center for the People & the Press, conducted Jan. 9-13, 2013 among 1,502 adults, finds that Americans continue to view other domestic initiatives as important priorities as well, despite their focus on the deficit. Growing numbers give high priority to dealing with education, the problems of the poor, crime and the environment. 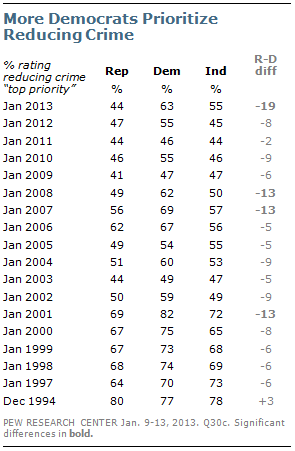 Fully 70% say that improving the educational system should be a top priority, up from 61% in January 2009. And 57% rate dealing with the problems of the poor and needy as a top priority; four years ago, 50% viewed this as a top priority. 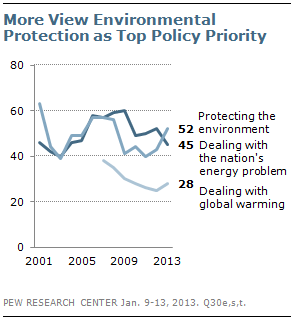 The survey finds that 52% view protecting the environment as a top policy priority, up 11 points from January 2009. However, dealing with global warming remains at the bottom of the public’s agenda for 2013; just 28% see this as a top priority, little changed from recent years. Gun control also ranks relatively low on the public’s priority list; just 37% rate it as a top priority, 18th out of 21 policy goals tested. This item was last asked in 2001, when support for gun control was much broader nationwide, and 47% rated it as a top priority. However, reducing crime has become a more important policy priority in the past year; 55% rate this as a top priority, up seven points since last January and the highest percentage since 2007. The public also continues to view the financial security of Social Security and Medicare as major goals. While 70% say taking steps to make Social Security financially sound should be a top priority, a comparable percentage (65%) says the same about making Medicare financially sound. The survey finds that energy has slipped as a policy priority since Obama took office. Currently, 45% say that dealing with the nation’s energy problems should be a top priority, down from 60% four years ago. As in past Pew Research policy priority surveys, Republicans and Democrats offer differing views about the importance of many of the country’s most pressing issues. Broad majorities of Republicans and Democrats see the economy and jobs as top priorities. And more than seven-in-ten Republicans (74%) and Democrats (72%) say making the Social Security system financially sound should be a top priority, though they may have different views about how to do so. There is far less consensus on other issues, with some of the largest differences over the environment, gun control, and health care. Nearly seven-in-ten Democrats (69%) say protecting the environment should be a top priority compared with just 32% of Republicans. Democrats also are much more likely to emphasize strengthening gun controls laws (56%) and reducing health care costs (79%) than are Republicans (22% and 46%, respectively). By contrast, Republicans are far more likely than Democrats to say strengthening the military is a top priority (58% vs. 31%). Republicans also are 17 points more likely than Democrats to say the budget deficit is a top priority, though a majority of Democrats (67%) also give the deficit top priority. 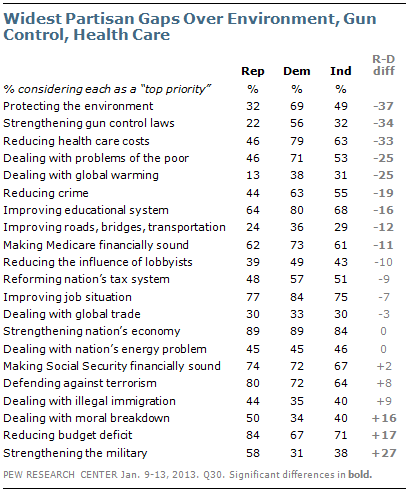 Democrats view more issues as top priorities than do Republicans. Across the 21 issues tested, majorities of Democrats say 13 are top priorities for the president and Congress. 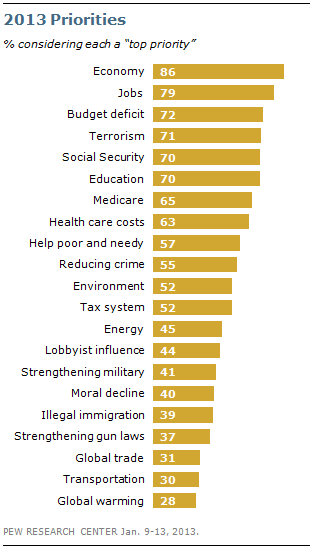 Among Republicans, majorities consider eight issues as top priorities. The budget deficit has increased as a priority since 2009 among Democrats, independents and especially Republicans. Currently, 84% of Republicans say that deficit reduction should be a top priority. While that is unchanged from last year, it is 33 points higher than four years ago, when just 51% of Republicans viewed reducing the deficit as a top priority. 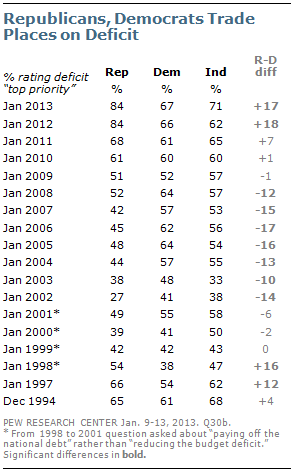 Democrats and independents also rate the deficit as a more important priority than they did in January 2009, though the increases have been smaller. Currently, 67% of Democrats view deficit reduction as a top priority, up from 52% four years ago; the increase among independents has been comparable (71% now, 57%). For the last few years more Republicans than Democrats have rated reducing the deficit as a top policy priority, but this represents a reversal from the Bush administration, when Democrats typically viewed the deficit as a more important issue. At the start of George W. Bush’s second term in January 2005, for instance, 64% of Democrats and 48% of Republicans said that reducing the budget deficit should be a major priority for the president and Congress. By contrast, during the Clinton administration, more Republicans viewed deficit reduction as a top policy objective. In January 1997, at the start of Bill Clinton’s second term, 66% of Republicans said reducing the deficit should be a top priority, compared with 54% of Democrats. Currently, 37% rate strengthening the nation’s gun laws as a top policy priority. In 2001, that last time this item was included on a January priorities survey, 47% viewed this as a top policy priority. More than half of Democrats (56%) give top priority to strengthening gun control laws compared with 32% of independents and just 22% of Republicans. Since 2001, the priority given to gun control laws has fallen by 12 points each among Republicans and independents while remaining more stable among Democrats; 61% of Democrats viewed gun control as a top priority in 2001, about the same percentage as today (56%). Women (42%) are somewhat more likely than men (33%) to call gun control a top priority. However, smaller percentages of both women and men view gun control as a top priority than did so at the start of George W. Bush’s first term. The current survey finds that views of the importance of strengthening gun laws are correlated with gun ownership and opinions about whether it is more important to control gun ownership or to protect gun rights. Nearly half (47%) of those who do not have a gun in their household view strengthening gun laws as a top priority, compared with 24% of those who do. And while 61% of those who say gun control is more important than gun rights prioritize stronger gun laws, just 12% of those who say it is more important to protect gun rights do so. For more on opinions about gun control, see “In Gun Control Debate, Several Options Draw Majority Support,” Jan. 14, 2013. Currently, 52% of Americans say protecting the environment should be a top priority, up nine points from last year. But that is still lower than the high of 63% who said the environment should be a top priority in 2001. At the same time, the percentage saying that dealing with the nation’s energy problems should be a top priority has slipped from 52% to 45% since last year. For the first time in five years, energy now ranks slightly lower than the environment on the public’s list of priorities. Dealing with global warming ranks at the bottom of the public’s priority list. Just 28% say it should be a top priority for the president and Congress, little changed from 2012. More Democrats and independents say the environment should be a top priority than did so a year ago. Fully 69% of Democrats say that, up 11 points from last year. 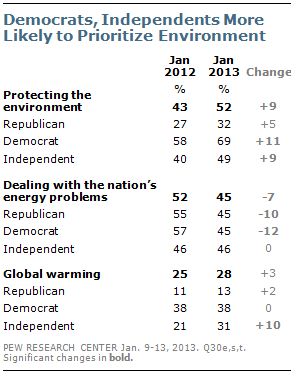 About half (49%) of independents think environmental protection should be a top priority, up somewhat from 40% in 2012. Just 32% of Republicans say that protecting the environment should be a top priority, little changed from a year ago. The 37-point partisan gap on this issue is among the largest for all the policy priorities. There also is a wide partisan gap over whether global warming should be a major priority. Just 13% of Republicans say dealing with global warming should be a top priority, compared with 38% of Democrats. This is among the lowest priority items for Democrats and Republicans. More independents think global warming should be a top priority (31%) than did so a year ago (21%). By contrast, there continues to be very little partisan difference on whether dealing with the nation’s energy problems should be a top priority; 45% of both Republicans and Democrats say this. Far more Republicans view strengthening the U.S. military as a top policy priority than did so a year ago. In the current survey, 58% of Republicans say this, up from 46% in January 2012. By comparison, 38% of independents and just 31% of Democrats say strengthening the military should be a top priority; both percentages are little changed from January 2012. Over the past decade, Republicans have consistently been much more likely than Democrats to view strengthening the military as a top policy goal. In January 2009, 64% of Republicans and just 38% of Democrats said strengthening the military should be a top priority for the president and Congress. But those differences narrowed considerably in 2011 and 2012, before widening again this year. A majority of Americans (55%) view reducing crime as a top priority for the president and Congress. This represents a sharp increase from recent years. 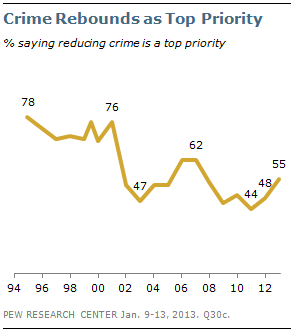 In 2011, just 44% said crime was a top priority. While up over the past two years, the percentage calling crime a top priority still pales in comparison to the percentages saying this in the 1990s and early 2000s. In 1994, for example, 78% said reducing crime should be a top priority, making it first among the items tested on that survey. The rise in crime as a top priority has taken place among Democrats and independents, while Republican views are little changed. About six-in-ten Democrats (63%) say crime should be a top priority, up 17 points from 2011. More than half of independents (55%) give top priority to reducing crime, up 11 points over the last two years. 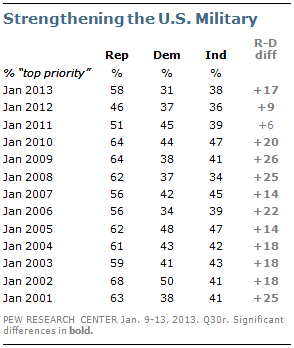 By contrast, just 44% of Republicans give high priority to reducing crime, unchanged from January 2011. As a result of these shifts, the gap between Democrats and Republicans is now as large as it has ever been, at 19 points.